This nicely appointed White Oak townhouse, within the gated community of Wintergreen Resort, is a CLEAN, NON-SMOKING, NO PETS unit that accommodates up to six guests, equipped with new mattress sets throughout (plush and pillow top). They all have very nice protective covers too. This is also our 2nd home, so we take great care to have a clean and comfortable place for our guests and ourselves. It is not packed with personal items though. We want you to feel at home! Located on the mountaintop in Wintergreen Resort. This three-level unit offers lots of privacy for you and your fellow travelers. WINTERGREEN RESORT is a 4-season resort. The home is adjacent to both hiking trails and ski slopes. A short walk to trails, ski slopes, Mountain Inn, special events, restaurants, bar, and convenience store. Enjoy the proximity of the slopes without the noise of the snowmaking machines! There is secure outside ski storage. In the Winter, after a day on the slopes, relax in front of the fireplace. In the Summer, enjoy Lake Monocan for swimming and boating (Sunday-Friday). The FREE fireplace wood is located in front of the unit. For your convenience there is a full size washer and dryer in the unit, as well as an ironing board and iron. 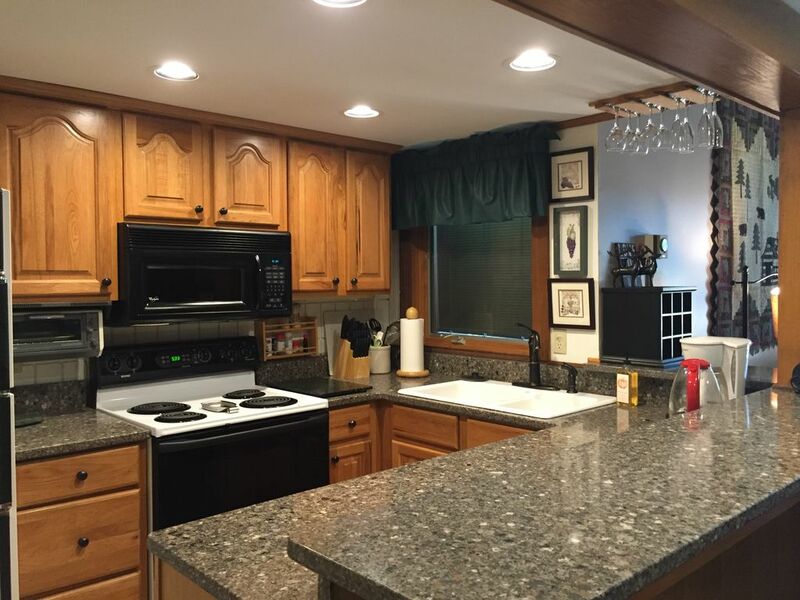 All linens are included and the kitchen is fully stocked with equipment, dishes, cookware, and utensils. Renters should bring consumable items with them. There are a variety of activities: hiking, skiing, spa, ice skating, swimming, paddle-boating, canoeing in local waters, fly fishing lessons at the resort, tennis (Stoney Creek), snow tubing, paint ball, video gaming, mini-golf, skateboarding, and more! Wintergreen was chosen as our second home because it is an amazing 4 season resort with much to do for an active family that enjoys the outdoors. We live in southern VA and Wintergreen is a quick trip to the mountains to escape the summer heat! Check out our other vacation property; listing #1123028. The slopes and other activities are a short walk from the home. This particular neighborhood has very few rentals, offering quiet and privacy. The White Oak condos at Wintergreen Resort are the ONLY condos/townhomes at the resort without shared floors/ceilings, allowing you to vacation without noise interruptions from neighbors. With sleeping quarters on 3 levels, it offers a lot of privacy for guests traveling together. 35 miles of hiking trails for all ability levels within the resort, plus resort adjacent to the Appalachian Trail and Blueridge Parkway. Area attractions include Crabtree Falls, Paul's Creek natural stone waterslide, and Sherando Lake. Fall/Winter mountain & valley views. Lush greenery in Spring & Summer. Rarely needed in cool Summer mountain temperatures. Stocked with all necessary dishes, glasses, utensils, pots & pans, etc. Table and 4 chairs, plus 3 seats at kitchen bar. 2 are Blue Ray (LR and master suite). 1 regular DVD (in loft). At Lake Monocan. Resort fees apply. Located in Wintergreen Resort, a popular ski / snowboard destination. Separate fees apply. Owner's pool access on Chestnut Springs Drive. Does not include indoor/outdoor Wintergreen Resort Spa pool. Internet access requires personal hot spot using the renter's own carrier service. This is not separately provided. It was a Amazing stay. The place was very roomy and felt like home. Had everything you needed and more to make it feel like home. Very close walking distance from the slopes also. I Highly recommend this place and will definitely will be back next year. Perfect location and condo! Enjoyed our stay! Great location and well stocked. Usually I bring paper products and a sharp knife and cutting board to rentals, but this one surpassed our expectations! It was well stocked with supplies (tp, paper towels, sharp knives and nice pots) and had plenty of towels and extra blankets and sheets. There was plenty of firewood and it was just a short walk to the ski slopes. A fantastic weekend stay! Beautiful vacation in the mountains for Christmas. The condo was close to all activities yet in a quiet setting. Plenty of room and very clean. Plenty of tv’s to allow separate viewing as needed. Excellent selection of games. Wineries & Breweries; Paint ball; Skateboard Park; Appalachian Trail adjacent to resort; Hiking for all difficulty levels; see Wintergreen Resort and Nelson County websites for scheduled events. The DOME is a feature for kids of all ages. Includes: zip line, pool tables, table hockey, mechanical bull, bungee bouncing, rock climbing, video gaming, sports area, air hockey. There is a $100 cleaning fee for each reservation, which is the amount charged by the cleaning service. No tax is added to this fee. HOLIDAYS: Require a 3 night stay.